In addition, there are two Special Quantity Subareas in Butler/Saunders and Platte/Colfax counties. No new or expanded irrigated acres are allowed in these areas, and several other restrictions apply. Variances are required for any new irrigated acres within the NRD. Before a well permit can be issued, you must have a variance from the NRD. The entire district is considered a “Level One” area, and all operators of irrigation, municipal, and industrial wells are required to be certified every four years. The NRD’s Hydrologically Connected Areas (HCAs) cover most of the Shell Creek, Platte Valley and Todd Valley aquifer regions. These areas were placed under a state-imposed moratorium in December 2008 when the Nebraska Department of Natural Resources preliminarily declared the Lower Platte Basin to be “fully-appropriated.” The state later reversed that preliminary declaration and the moratorium areas were opened back up to limited irrigation development. Up to a total of 2,500 acres a year can be developed in HCAs. Variance requests must be received in our office by September 15th of each year to be considered for the following year’s irrigation season. These Variance requests will be reviewed, given a ranking score, and a limited number of applications may be approved at the following October Board Meeting. Please wait to hear from the NRD before you buy any equipment, drill a well, etc. 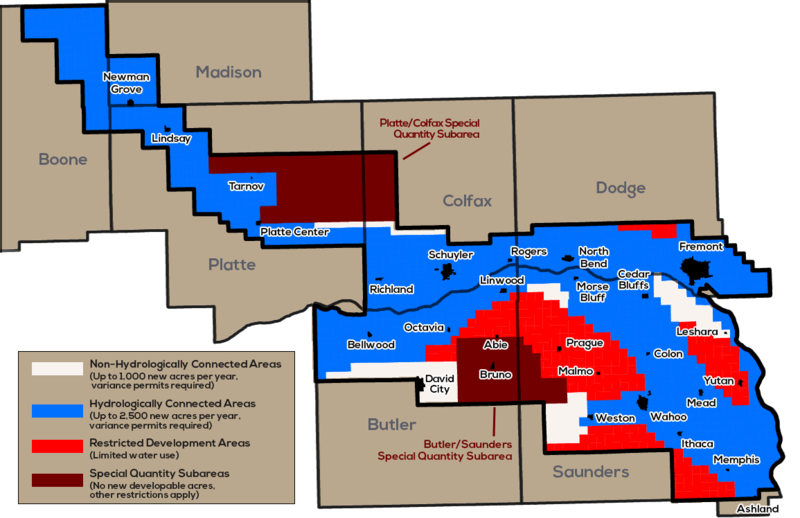 The NRD’s Restricted Development Areas encompass portions of the uplands region in Butler, Dodge and Saunders counties. Aquifers in these areas are thin or of limited size, therefore this type of development area is treated differently from the other two. Offsets are required, so if a landowner wishes to expand their water use at one location, then a similar amount of water use or acres must be retired within the same subarea. In this case the offset will be treated as a water transfer. Variance requests (with no offsets required) will be accepted for expanded irrigation if the field is within one mile of the border of the Restricted Development Area. Acre-inch allocations can be established and in a worst-case scenario, the well permit could be withdrawn and further water use prohibited. The deadline to submit applications can vary depending on the type of adjacent Development Area, but in most cases it would be best for the landowner to assume the deadline is August 15th so the application will be received on time at the NRD. Variance requests from the RDA will be reviewed with other applications from the adjacent Areas, given a ranking score, and a limited number of applications may be approved at the following September or October Board Meeting for the following year’s irrigation season. Please wait to hear from the LPNNRD before you buy any equipment, drill a well, etc. In the Restricted Development Area, Variances are also required on small capacity wells except for a domestic well irrigating less than 1 acre of land or a well used to water range livestock. There are two Special Quantity Subareas in the NRD, in Butler/Saunders and Platte/Colfax counties. 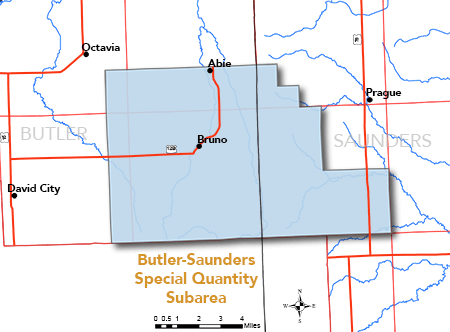 The Butler/Saunders area covers approximately 56 square miles of east-central Butler County and 30 square miles of west-central Saunders County. 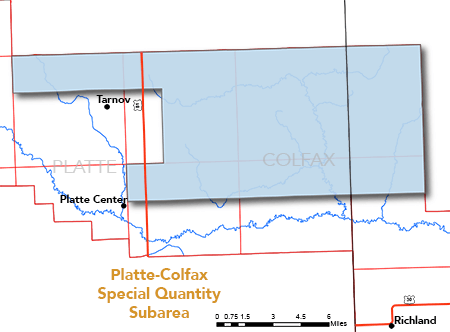 The Platte/Colfax area covers approximately 100 square miles of central Platte County and 32 square miles of west-central Colfax County. 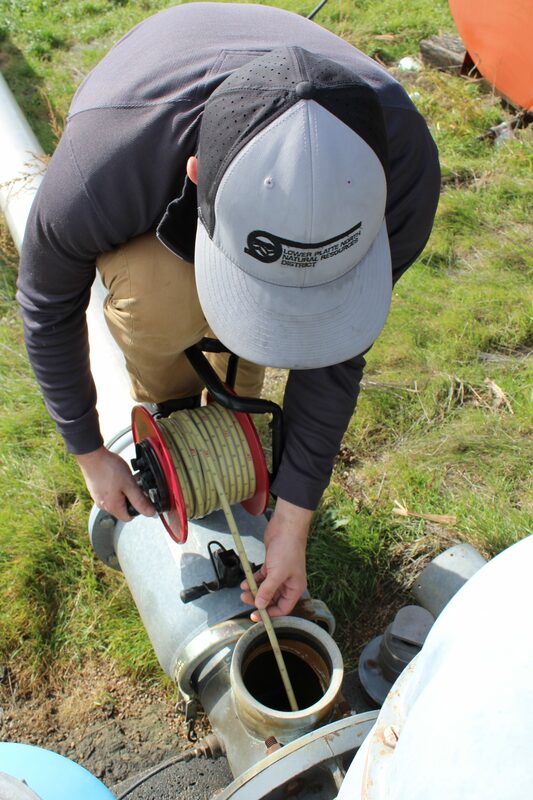 With the help of area cooperators, a groundwater energy level monitoring network is used in the Lower Platte North NRD to track changes in groundwater levels. Typically there are 140-150 wells in the NRD’s monitoring network. These wells are measured twice a year (once in the fall, once in the spring). The district also operates several dedicated monitoring wells that continually log groundwater levels. The map shows overall conditions with the most recent water level readings factored in. Blue areas are “Level 1” areas, where water levels in the aquifer are within historical norms compared to the 1987 base year. Yellow areas are “Level 2” areas, where water levels in the aquifer have declined approximately 10% since 1987. Red areas are “Level 3” areas, where water levels in the aquifer have declined approximately 15% since 1987. Gray areas are areas where the NRD is still gathering data to establish a baseline. In these areas, groundwater levels can be highly volatile and heavily influenced by drought and groundwater pumping. Restrictions on pumping during certain times of the day or the establishment of a system of rotation for pumping could also apply in the SQSs. Anyone wishing to develop new irrigated acres within the Lower Platte North NRD must apply for a variance from the district. The Lower Platte North NRD began certifying irrigated acres in the district in spring 2010. Certification is intended to catalog all existing irrigated acres and attempt to bring together records from LPNNRD, County Assessor and FSA. It is not uncommon for all three entities to have a different number of irrigated acres on a parcel. The Nebraska Department of Natural Resources (NeDNR) conducts an annual evaluation of all river basins in the state to determine if they are “fully appropriated.” If a basin is declared fully-appropriated, NRDs are required to impose a stay on new water wells and expansions of water use, effectively halting the expansion of irrigation. While the Lower Platte basin is not currently fully appropriated, that could change after any of NeDNR’s yearly reviews. In the event that the Lower Platte Basin were to be declared fully appropriated, producers that have had their acres certified as irrigated by LPNNRD, prior to a declaration, would continue to have the ability to irrigate those acres. This is one way that certifying irrigated acres is advantageous to the producer. In LPNNRD’s Restricted and Hydrologically Connected Areas, a variance is required to expand irrigated acres. Certified acres are used as the baseline when evaluating proposed changes in water use in the moratorium areas. The intent is to make certification as simple and painless as possible for landowners. Landowners received a form to fill out regarding which well(s) were used to irrigate a parcel, the delivery mechanism for the irrigation, and whether the currently listed irrigated acres on file with the County Assessor was correct. Each packet included a detailed instruction sheet that thoroughly explained what was required for each question on the form. To certify their irrigated acres, landowners filled out the Acre Certification form in its entirety and returned the signed and dated copy to the NRD. Many landowners chose to call LPNNRD and set up a time to meet with staff to go over the paperwork. This came to be the preferred method as any questions or inconsistencies in the paperwork could be addressed immediately instead of having to try to get in contact with the landowner. As a reminder, Acre Certification is an ongoing process. Acres that have already been certified need to continue to be irrigated two out of every ten years or they may lose their certified status. New irrigated acres, added through the variance or transfer process, will be sent the relevant certification forms once it has been determined the approved project was satisfactorily completed and the irrigation drawn on a map for reference. Landowners need to be current on their NRD nitrogen management and water conservation training to have their acres certified, failure to maintain nitrogen certification will lead to a revocation of certified irrigated acres. Failure to successfully certify irrigated acres with the LPNNRD can result in a cease and desist order against irrigation for the affected landowner. LPNNRD encourages anyone looking to purchase a piece of property in the district that is listed as irrigated, to call the office and verify the certified acres prior to purchase of the ground. Download a complete version of the current draft of the Lower Platte River Drought Contingency Plan here. To protect our precious groundwater supply, the Lower Platte North NRD encourages everyone to conserve water whenever they can. Conserving water isn’t just good for the environment — it’s a good way to save money too. Here are some guidelines you can follow that can help you greatly reduce water use. Use more drought-resistant crop varieties. Recent research has shown that even regular corn varieties can be water-stressed when the corn plant is in its early growing stages and it will not affect yields if the corn receives adequate water in the tasseling to late reproductive phase. This can save two to four inches of water over the course of a summer. A simple crop rotation of corn and soybeans can save water compared to continuous corn. Switch from gravity to pivot irrigation, or from high-pressure to low-pressure systems. Installing a water meter or time totalizer can help you track your water use. This will help you be more precise in your water applications (saving on fuel costs and using water efficiently), and can also help identify leaks or other problems with your system. Use more drought-resistant grass varieties, such as fescue, zoysia, or buffalo grass. During the summer, let your lawn go dormant and water just enough to keep the roots alive. Avoid watering during the warmest times of the day. Water in several short sessions rather than one long one to maximize absorption. Mulch your garden and flower beds to reduce evaporation. The most common source of leaks is the toilet. To check your toilet for leaks, put a few drops of food dye in the tank and wait 15 minutes. If color appears in the bowl, you have a leak that should be repaired. Leaky toilets can usually be repaired inexpensively by replacing the flapper or adjusting the water level. Dripping faucets can usually be repaired by replacing the rubber washer or O-ring inside the valve. Turn off the water when brushing your teeth or shaving. This small step can save more than 5 gallons a day. Don’t let the hose run when washing your car. Use a bucket of water and sponge, then turn on the hose only to rinse. Don’t run water from the faucet to get cold water. Keep a bottle of water in the refrigerator. Use brooms instead of a hose to clean patios, decks, sidewalks and driveways. Use a rinse basin or sprayer for rinsing hand-washed dishes and other items instead of running water. Reduce flushes by not using the toilet as a waste paper basket. Water plants with leftover water from washing vegetables, leftover coffee, etc. Wash patio furniture, cars, plant containers, waste baskets and other items near or on the lawn to reuse the water. Use an environmentally safe mild cleaner — avoid strong cleaners that may damage plants. By installing water-efficient equipment and/or replacing old fixtures and appliances, you can achieve significant water savings. Toilets and showerheads installed prior to 1994 should be updated. Install an aerator to your faucets to achieve a similar stream using less water. Consider replacing an old traditional water softener with an “on-demand” model. On-demand softeners use less water by responding to actual water use and water hardness rather than a timed schedule.